When I worked in television, standard procedure required that all films be seen in an early rough cut by the program editor. These viewings filled me with dread. Not only was I revealing my carefully nurtured work to the outside world for the first time; I also happened to work for a screamer. Tim almost never liked the first cut of anything, and his displeasure took the form of tantrums: yelling, screaming, throwing phones against the wall, occasionally dragging in other producers to see what a miserable piece of dumb garbage I'd wasted his budget on. The only (very slight) compensation was knowing that he treated everyone this way. Tim was a toxic boss. I'd been working in broadcasting for five years, and I'd never seen behavior like this before. So I thought Tim was unusual. But he wasn't -- and he isn't. Have you noticed how busy everyone seems today? Many of the people I talk to feel overloaded with commitments and activities, and demands on their time and energy. It seems that there is always too much to do and too little time. Whenever your stress levels are high it doesn't take much to tip you over the edge into that most unwelcome state called "Overwhelm." Overwhelm is what we feel when there are lots of things we need to do, we don't know what to start on first, and we fear that we will never be able to get it all done. HingeHeads™ is a new and unique high-concept design, manufacture and marketing Company. 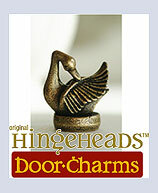 Our flagship product, HingeHeads™, is best described as an evocative door finial & charm. HingeHeads are fun, expressive, decorative hardware that is designed to bring a new level of artistry and awareness to a usually unsung, yet very important piece of metal-ware in our homes. HingeHeads has over 150 designs to date and a list of future designs that exceeds 300. We also make custom designs for our customers. Made in the USA and handcrafted as limited editions of various sizes, HingeHeads are often imaginatively re-purposed by end users as altar pieces, Christmas ornaments, personal game pieces, hood ornaments, charms and decorative miniatures, to name a few. HingeHeads make great gifts due to their unique themes and positioning; and their prices make them a good value for expressing a special feeling or thought for someone without needing to get a loan! Will you be attending Digital Life, coming to New York City on October 14-17? Stop by the WITI Booth to meet Robin Raskin, former Editor in Chief of Family PC magazine and now The Internet Mom. She will be discussing how to use technology to save money and time while creating great holiday memories! Shows daily at 12:00 pm, 3pm and 5pm. Paladin International and Business and Technology Insider Radio are bringing you an entire format to prepare you to talk directly with federal agencies about specific opportunities. Don't walk away scratching your head about where to go next...come to "Marketing to the Federal Government" at the Sheraton Premiere in Vienna, VA on Nov 2-4, 2004, and be ready to talk real contracts! Confirmed participants include DHS, ARMY, Commerce, NASA, HHS, DOJ, DSS, OPIC, GSA Advantage and more! We have the Contracting Officers from some of the major agencies presenting contract opportunities. Accomplish more with us in 3 days than you can on your own in a month or more! WITI Members: Discounts are available! Visit the Member's Area for more information! For more information about this event, visit www.technologyinsider.net/mfg04/. Oracle cultivates a work environment that is inclusive of all employees. Individual differences enrich Oracle's creative, agile work atmosphere and present us with opportunities to examine business issues from varying perspectives. Communicating effectively and demonstrating mutual respect is simply good business. Using strong ethics and values to guide us in our hiring policies puts us at a distinct competitive advantage. Effectively competing on a global scale requires the strength of a unified workforce fully engaged in meaningful work. Your current knowledge, your past work experience, and your history of top performance are examples of legitimate guidelines for evaluating your potential to succeed in the Oracle workforce. Our recruiting policy is to identify candidates with proven records of success and/or evident potential for success. The result is natural: a multicultural atmosphere rich in diversity and enriched by diversity. Search for Oracle jobs on WITI4Hire. Leading Novell Platinum Partner based in Newark, CA seeks a Novell systems engineer for our award-winning Enterprise Systems Group. You'll design, install, and troubleshoot Novell-based LANs and WANs for a wide variety of clients and environments all over the Bay Area. Must have extensive experience with and positive enthusiasm for Novell products. (Do you bleed "Novell Red"?) This includes any or all of: Netware, GroupWise, ZENworks, DirXML, BorderManager, eDirectory, and/or exteNd. This position has a substantial amount of customer contact; outstanding customer service skills required.